Handmade, sturdy steel construction. Black powder coated, beautiful and elegant design. 11.8" & 10.2" bowls. Open design helps fruits and vegetables to evenly ripen. Stacked bowl arrangement creates easy access to stored items. Bowls can easily be removed to use as separate serving pieces. 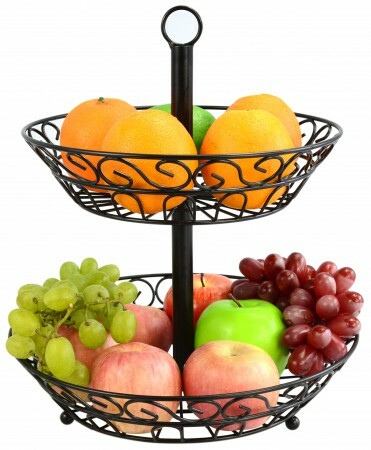 Surpahs Handmade 2-Tier Countertop Fruit Basket, black color powder coated.